www.officer.com January 2016 Law Enforcement Technology 23 enforcement agencies are facing more difficulties. 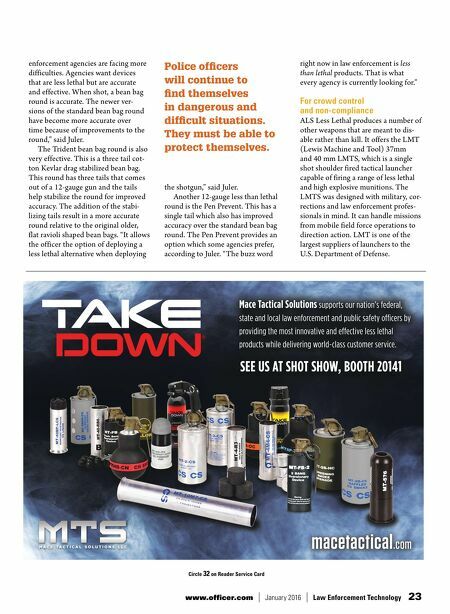 Agencies want devices that are less lethal but are accurate and effective. W hen shot, a bean bag round is accurate. The newer ver- sions of the standard bean bag round have become more accurate over time because of improvements to the round," said Juler. The Trident bean bag round is also very effective. This is a three tail cot- ton Kevlar drag stabilized bean bag. This round has three tails that comes out of a 12-gauge gun and the tails help stabilize the round for improved accuracy. The addition of the stabi- lizing tails result in a more accurate round relative to the original older, flat ravioli shaped bean bags. "It allows the officer the option of deploying a less lethal alternative when deploying the shotgun," said Juler. Another 12-gauge less than lethal round is the Pen Prevent. This has a single tail which also has improved accuracy over the standard bean bag round. The Pen Prevent provides an option which some agencies prefer, according to Juler. 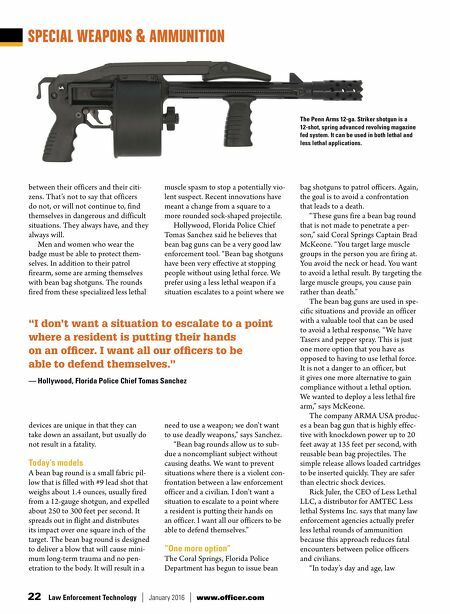 "The buzz word right now in law enforcement is less than lethal products. That is what every agency is currently looking for." For crowd control and non-compliance ALS Less Lethal produces a number of other weapons that are meant to dis- able rather than kill. It offers the LMT (Lewis Machine and Tool) 37mm and 40 mm LMTS, which is a single shot shoulder fired tactical launcher capable of firing a range of less lethal and high explosive munitions. The LMTS was designed with military, cor- rections and law enforcement profes- sionals in mind. It can handle missions from mobile field force operations to direction action. LMT is one of the largest suppliers of launchers to the U.S. Department of Defense. Circle 32 on Reader Service Card Police offcers will continue to fnd themselves in dangerous and diffcult situations. They must be able to protect themselves.